Finally, some news most moms-to-be may be delighted to hear. In a study presented today at the 36th Annual Pregnancy Meeting by the Society for Maternal-Fetal Medicine, researchers revealed that eating high-flavanol chocolate while pregnant could have a positive impact on fetal growth and placental function. The study’s implication is that high-flavanol chocolate consumption likely increases blood flow, at least in pregnant women. For the study, researchers observed 129 women for 12 weeks; Participants were between 11 and 14 weeks pregnant and were each carrying one child. 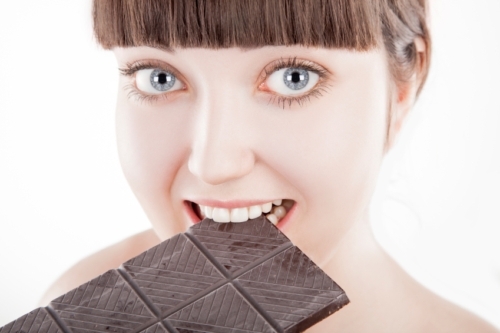 During the study, participants ate 30 grams of high-flavanol dark chocolate every day. The property in chocolate that is possibly the key to this health benefit is a compound called flavanol. Flavanol is found not in the more sought after milk chocolate—but rather in dark, unsweetened chocolate. According to study researcher Emmanuel Bujold, the beneficial effect of consuming high-flavanol chocolate is not entirely due to its flavanol content. Nonetheless, this is good news for pregnant women who happen to simply like the taste of dark chocolate. More tests are planned for a future time to study a control group that does not eat chocolate. This will allow researchers to better determine what the results mean. Of course there are certain risks involved when consuming chocolate in general. Chocolate contains a lot of sugar and is high in calories, so limiting the amount of chocolate you consume is advisable—especially when it comes to maintaining a healthy weight. The sugar levels found in chocolate can also play havoc on the teeth and potentially lead to tooth decay. Needless to say your dentist wouldn’t be happy. So if you have a sweet craving, stick to dark chocolate—at least 85% cocoa—as research published in the Journal of the American Heart Association also shows that dark chocolate can boost your fitness levels! The evidence is not yet conclusive but things are looking up for chocolate lovers. “High-flavanol chocolate to improve placental function and to decrease the risk of preeclampsia: a double blind randomized clinical trial,” American Journal of Obstetrics and Gynecology, 2016; 214(1):S23-S24, doi: 10.1016/j.ajog.2015.10.056. “Chocolate: Health benefits, Facts, Research,” Medical News Today web site; http://www.medicalnewstoday.com/articles/270272.php, last accessed February 3, 2016.